A hurricane is building over the Gulf of Mexico, threatening the coastal town of Bois Sauvage, Mississippi, and Esch’s father is growing concerned. A hard drinker, largely absent, he doesn’t show concern for much else. Esch and her three brothers are stocking food, but there isn’t much to save. Lately, Esch can’t keep down what food she gets; she’s fourteen and pregnant. Her brother Skeetah is sneaking scraps for his prized pitbull’s new litter, dying one by one in the dirt. While brothers Randall and Junior try to stake their claim in a family long on child’s play and short on parenting. As the twelve days that comprise the novel’s framework yield to the final day and Hurricane Katrina, the unforgettable family at the novel’s heart—motherless children sacrificing for each other as they can, protecting and nurturing where love is scarce—pulls itself up to struggle for another day. 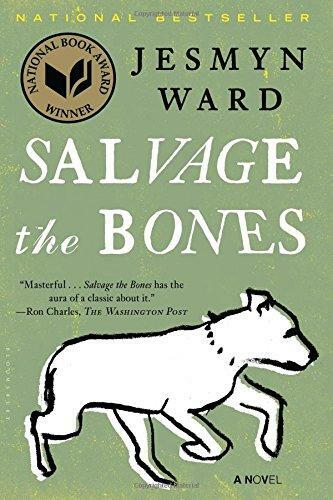 A wrenching look at the lonesome, brutal, and restrictive realities of rural poverty, Salvage the Bone is muscled with poetry, revelatory, and real.